Another return! This time La Bonita was open so I played across the street on the sidewalk on the south side of Alberta. First thing I did was set up my benches, and then began donning the equipment. As I was tuning my guitar a couple of kids ran by with ice cream cones, followed by a woman I figured was their mother. She walked past and stopped, and keeping her back to me she muttered audibly, “I’m so sorry the revolutionary council couldn’t provide you with benches.” I have to wonder, was I transgressing by playing in this spot? Well, she walked off before I could engage, so I went ahead and transgressed, er, played. The revolutionary council never showed up, but during the second or third song, I saw my friend Katie coming across the street. I was delighted to see she took in the remainder of my show perched on a bench. It was a pretty warm day, and a lot of families and large groups were strolling down Alberta. Some stuck around, some even sat down. I had wisely chosen to stand in the shade of the building while the placement of my benches encouraged spectators to bask in a sunny space before me. Maybe half an hour in, another friend rolled up on his bike, locked it up, and took a seat on the other bench. It was none but Jeffrey, taking a break from learning new words so he could see what all this one man band nonsense was about. It was about two hours, is what it was. I played from 5pm to just after 7pm, to maybe 50 different people stopping to watch here and there (although only Katie and Jeffrey stuck it out to the bitter end). As the sun kissed the horizon I decided to call it a day–before these old legs gave out altogether. Although I enjoyed much of what transpired during my show (La Bonita sidewalk diners not complaining, people crossing the street to come listen) my favorite moment was after I played a song and a little boy came up to ask me what it was called. “Entropy,” I replied, and he asked, “What’s Entropy?” I told him: Kid, ask your parents. You don’t want to learn about something so important from some punk out in the street! This entry was posted in Shows on April 18, 2015 by a one man band. The weather continues to cooperate for a return to the site of a previous show. The first time I played on this corner, it was dusk and got dark while I was playing. I had intended to play on the wide sidewalk in front of the church on the corner, but they were running an event that would have probably been disrupted by my commotion, so I stayed on the (significantly narrower) sidewalk across the street. It turned out to be a fun show, but it wasn’t what I expected going in. Enjoy the show from these surprisingly comfortable portable benches. Also, this corner is within hobbling distance of my friend Erin’s house. Which is significant because she right now she suffers from a broken ankle. And how was I able to entice her to limp over and watch the show for a while? It was nought but the promise of a comfy place to sit. And although Russell typically boasts few pedestrians on a Saturday afternoon, getting one person to sit down leads to another, etc., and I spent a decent amount of time playing to actual people. 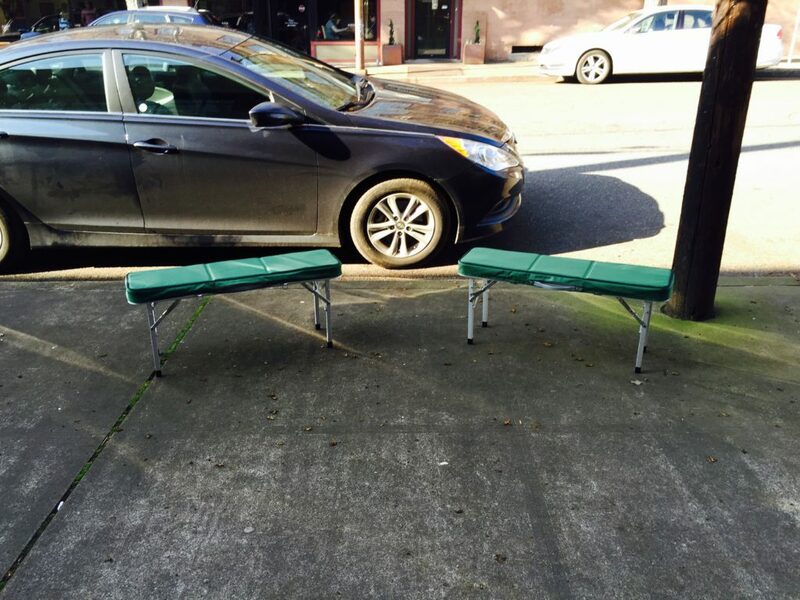 Portable benches were a hit; look for them at future shows. And sit down! In case you ever wondered, yes it is a little daunting to strike that first chord or drum beat, or to sing that first note. But I’m getting better at starting shows; mainly I just play the same first song every time, and things kind of flow from that. What I’m having trouble with lately is ending shows. Although many are the people who will never think I’ve stopped too soon, lately there’s always a couple of people who walk up and wait for the “next song” just as I’ve decided I’ve had it and it’s time to go. For any such people, I often play a song or two, for it’s hard to pass up so fleeting and rare a thing as an audience. And how could I disappoint that uncommon person who actually wants to hear me play? Ah, but now I have the benches, so a bit of leverage allowed me to offer a deal: sit on the bench and I’ll play another song. And it actually worked, perhaps even too well. For just as I finished one person’s “last song” some more people would stop and want their last song, and so on. In all, these “encores” went on about 20 minutes past when I thought I would stop. One of the last people I played to was a family with two young kids, and I scoured my brain to think of a kid-friendly song that I also felt like playing. Perhaps owing to fatigue, having already played close to 90 minutes, for some reason I thought “Mummy” would be appropriate, and it was for two verses, with its quick tempo and shouts about the mummy’s curse. But the third verse talks about the bloody deaths of the desecrators of King Tut’s tomb, as the mummy’s curse fulfills its purpose. It’s meant to be a fun, silly song, but…for adults? Alas, this only occurred to me as I began singing the third verse, so I just forged ahead. Most likely, it all went over the kids’ heads, and I didn’t traumatize them for life. I hope. This entry was posted in Shows on April 4, 2015 by a one man band.